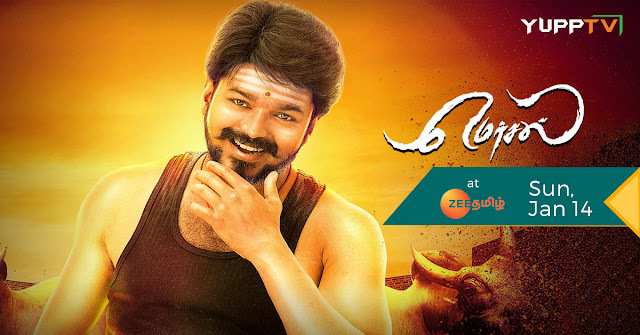 The recent Super Hit film that has become one of the highest grossing Tamil Films ever, Mersal starring Vijay, Kajal Agarwal, Nithya Menon, S J Surya, Sathyaraj, etc., is now coming to your flat screens through Zee Tamil. Watch Mersal Movie on Zee Tamil through YuppTV from all over the world. Channels offering Blockbuster movies as a part of Festival or Special Day celebrations is a ritual that is observed worldwide. As the most celebrated festival Makar Sankranthi is close, Channels have been showering advertisements of the films they are offering before and on the day of the festival. Since the festival is merging with the weekend, it is encouraging the channels to deliver top end films. Mersal comes aboard as a part of the same ritual which is a feast for the audience since the movie was a very recent release. Here is some information about the film in case if you haven’t watched it yet. Mersal the super hit film, which is directed by Atlee and co-written by K V Vijayendra Prasad who penned down All time Blockbusters like Bahubali Series, Bajrangi Bhaijaan, and most of Telugu Director S S Rajamouli’s films. Tamil Superstar Vijay is the lead actor in the film and the movie’s music has been composed by A R Rahman. Mersal is an Action thriller Tamil film depicting the story of a doctor who attempts to expose the corruption in India’s Medical industry. With Vijay’s splendid performance and the director Atlee’s magical direction, the film became an all-time hit and one of the highest grossing films in Vijay’s career. You can watch Mersal, this Pongal i.e., 14th January, on Zee Tamil through YuppTV. Zee Tamil can now be accessed from anywhere in the world through YuppTV. Since YuppTV supports a variety of platforms like Smart TVs, Smartphones, Laptops, Computers etc., one can easily watch the film at their convenience.